and if you look close you will see 'she' has three holes. To me, the holes look on the small side, but when I looked closely at some of them, they had been used. I just think some of these are so odd....I cannot help but wonder what people were thinking when they made them. At least people have a fun sense of imagination. Even though we went for a drive yesterday, I did do a little bit of sewing when we got home. I finished seven more of the 6½ inch crumb blocks, keep in mind they were already started. I got others very close to being finished...so will keep working on them. I am sitting here watching the birds at my feeders. The goldfinches are out here thicker than normal, but probably not near as many as some of you have. And the house sparrows, and the house finches....along with a couple of huthatches and a cardnal or two. And a squirrel has been underneath the feeders. I always throw some sunflower seed on the ground especially for them, though unless it gets really bad it is normally just this one little squirrel that has lost most of its tail. We have an upside down culture these days. That birdhouse is definitely on the strange side, but thanks for sharing it. Thanks, too, for the video, even though it does make me wonder if people have to lose their common sense when they go to work for the government. 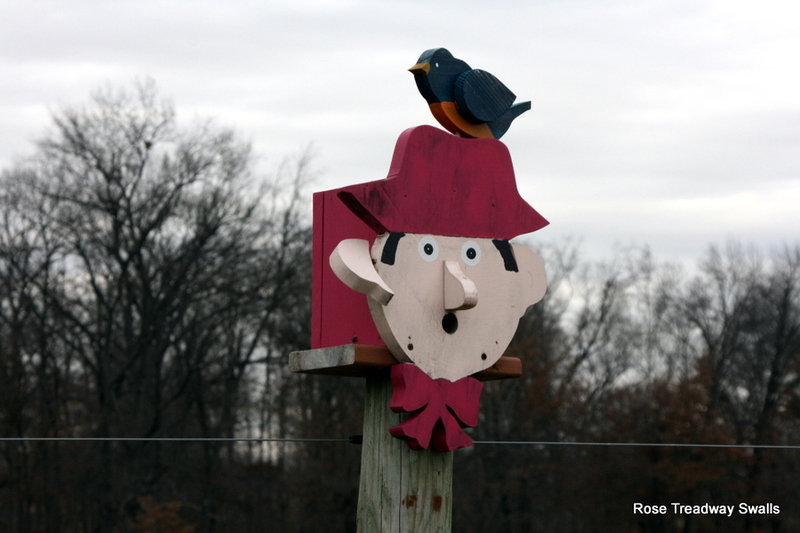 Wow, I have never seen anything even close to these birdhouses!!! The tiny holes...they are for tiny birds of a particular size. Maybe wrens. It is so the bigger birds can't come in and take their home. These people did a kind and caring thing and get punished for it? The world is upside down. definitely not the norm for birdhouses. i bet the birds don't care.i am wondering why a cop did not know it is against the law and call wildlife rescue. but it is totally crazy to do time for it. a fine for breaking the law maybe. like he said a ticket. after they kept it that long though it would think all people were friendly. Unbelievable about that couple who saved the deer... This darn country is going to H____ in a Handbasket for sure... Makes me furious. Those are strange looking bird houses for sure... Maybe somebody had a contest at one time --asking for creative birdhouses....????? Hope you made it through that storm last recently with no ICE. We had ice here but luckily, it wasn't too bad. I can't believe that someone who does a kind thing gets punished for it, pretty soon no one will do anything to help anybody or anything. That last one is crazy. Oh, my hubby just told me about this couple tonight. I hope there is such an outcry about this injustice that something will be done! I just hate that someone opened the gate and let the deer loose. You know she won't know how to take care of herself after being domesticated! 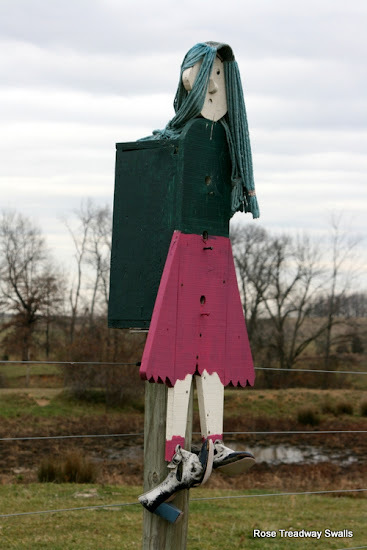 Very unusual birdhouses! 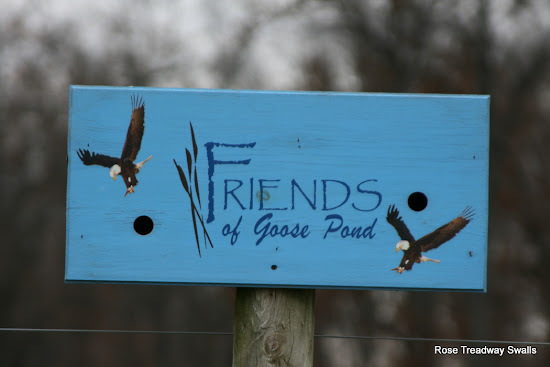 Will have to look for these the next time I get to Goose Pond...whenever that might be. Why on earth would you press criminal charges against someone for saving a fawn??? That is the dumbest thing I've ever heard of. I can't believe those lovely caring people will have to endure a trial. Unbelievable! Never have I seen birdhouses like that! About the deer, very weird!! What a RIDICULOUS situation! I just can't get over how people are being harassed for just being good people these days! For growing food, for wanting privacy, for flying an American flag in a neighborhood. It's boggles the imagination! Thankfully the little deer was saved. These people did the right thing.